During World War II, two American soldiers (Dean Martin, Rio Bravo, and Montgomery Clift, A Place in the Sun) try to adjust to the military structure, while on the other side of the trenches, a confused Nazi officer (Marlon Brando, A Streetcar Named Desire) tries to find some validity to his cause. After the end of World War II, an avalanche of films dealing with the aftermath of the conflict came out of Hollywood. Gone were the uplifting, propaganda films that served to condemn the actions of the enemy and glorify the heroic spirit of the allied forces. Innocence seemed forever shattered by the new harsh realities of the real world. Although most of these war films were gritty, realistic accounts of what actually took place during the final stages of the conflict, they still managed to be one-sided stories heavily glorifying the struggles of the American soldiers. The 1950s saw a change of attitude, as the major Hollywood studios were no longer afraid of not only questioning our role in the war, but they also started producing films that actually presented the enemy in a more realistic manner. Suddenly, the faceless monsters of the Nazi regime became human beings made of flesh and blood still capable of the most horrific acts. Based on the controversial novel by Irwin Shaw, The Young Lions presents war from both sides of the coin, never, never resorting to demonize the enemy. Viewers didn’t take kindly to being told that Nazis were people too, but that’s precisely why this movie has stood the test of time far better than lots of war films from the era. 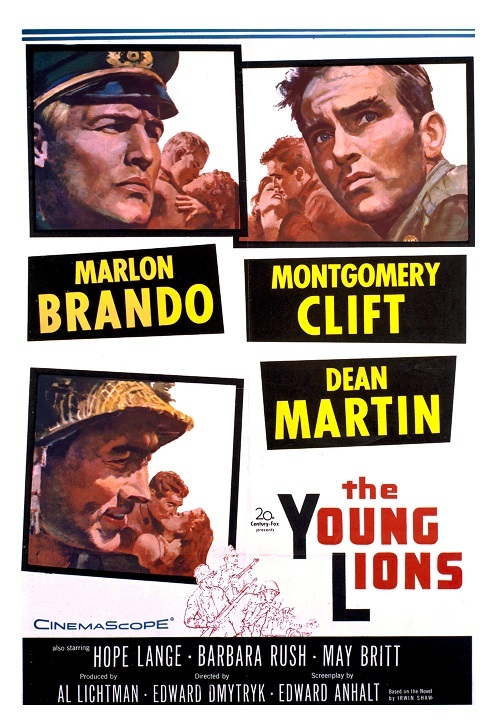 The Young Lions, written by Edward Anhalt (The Boston Strangler), directed by Edward Dmytryk (The Caine Mutiny), manages to be both an intimate portrait of three very different soldiers dealing with the demands of a world in chaos, and a sweeping, grand scale war epic with a few well-staged battle scenes. The film gets most of its energy from a trio of offbeat performances. Dean Martin had just broken up his act with Jerry Lewis and was in much need of proving his talents as an actor. Here he got one of his first opportunities to tackle a fully dramatic role. Some Came Running was released around the same time and both movies finally convinced his most ardent detractors that he was more than just a crooner. Marlon Brando gives one of his most interesting and overlooked performances — the troubled, decent Nazi officer who slowly realizes the sinister intentions of his government is vividly accomplished. Brando’s incisive, completely believable performance is the main attraction, and his work here represents his last bona fide hit until his triumphant comeback in the 1970s with a little film called The Godfather. On the other hand, Monty Clift seems to be years ahead of his best work as an actor. After receiving serious injuries during a car accident, his face never looked quite right again. The loss of his matinée idol look took a toll on him, sending this great actor straight to the bottle. As the Jewish soldier who eventually earns the respect of his fellow soldiers, his cadaverous appearance and shaky movements are all the too apparent, giving his character an edge that was not in the script. The Young Lions’ frank view of the people who fought the war was ahead of its time. Although not great-great (the ending feels a bit flat), this movie is recommended for fans of war films and/or fans of any of the principal stars, especially of the always-fascinating Brando. Also starring Hope Lange (Peyton Place), Lee Van Cleef (For a Few Dollars More), Mary Britt (Haunts), and Barbara Rush (The Young Philadelphians). Maximilian Schell (Judgement at Nuremberg) makes his American film debut as Capt. Hardenberg. B&W, 167 minutes, Not Rated. This is another one that slipped under the radar for me. Thanks for the review. What a strange quad of actors starring together! You are so right about the cast. Very curious selections!